6 Miles til Great Basin National Park. 4 sovepladser, vidunderlig udsigt over bjergene. Vintage remodeled 1952 trailer. 2 soveværelser et med fuld seng og et med køjesenge godt for børn. Også foldout sovesofa i stuen. Smuk udsigt over bjergene og lang udsigt over ørkenen. Over ser en frugthave ofte med hjorte græsning. Masser af parkering og plads til at sidde udenfor og nyde mørke himmel med vidunderlige stjerner. Hvad gør dit sted unikt? Lav et overskrift og en beskrivelse, der giver gæsterne en følelse af, hvordan det er at opleve et ophold på din ejendom. De detaljer, du giver hjælp, beroliger gæsterne, at din ejendom skal imødekomme deres behov og sikre, at deres forventninger opfyldes, når de ankommer til deres ophold. Disse er bare det grundlæggende. Du kan tilføje flere detaljer når som helst i ejendomseditoren. Thanks for staying with us and hope you come back. Our stay in the restored 1952 Mobile Home was delightful. The owners, Rex & Rowena, are gracious & friendly people. 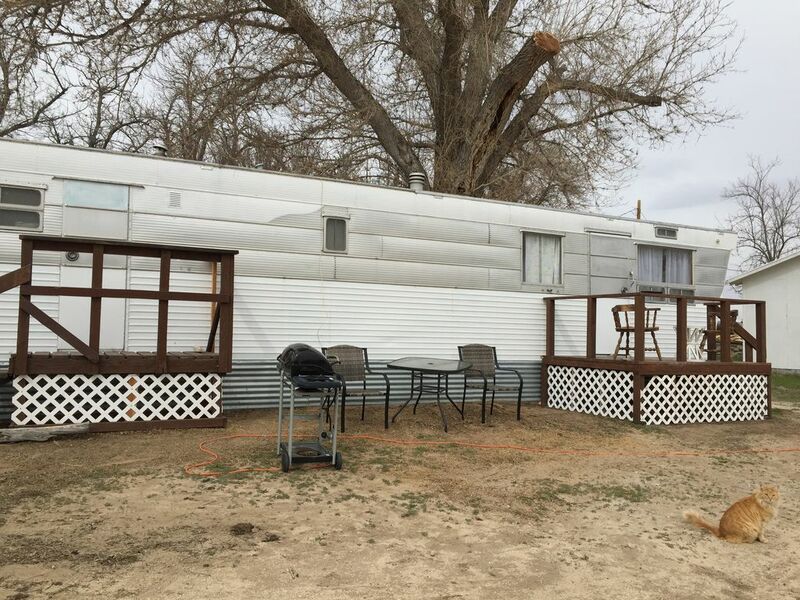 The trailer is sited just behind their home in the very small town of Baker, NV. The bed was comfortable - plenty of hot water for shower and kitchen - the unit is clean & well stocked - there are many windows allowing in light and views of the landscape. A nice restoration. Original wood paneling throughout. We appreciated the ample park & town information provided (maps, menus, brochures). It helped us plan activities. We enjoyed the many deer that hopped the fence in the evening to feed just feet from the trailer. We sat at the dining table to watch their evening strolls and sat at the same table in the morning to await the sunrise. Very nice! Great Basin NP is a 10-15 minute drive and well worth visiting. There are: spectacular views, wonderful alpine type hiking, Lehman Caves tours…and when available…a Ranger led astronomy program. We especially enjoyed the hike to the Bristlecone Pine Trail and seeing the oldest living organisms in the world. Magnificent! There is an exceptional restaurant, Kerouac’s, in town (now closed for the winter) which was a happy surprise. Rex recommended it and he was spot on! This is city class dining in a village location. A couple originally from New York owns & operates the restaurant. The food is made from scratch, delicious & interesting, there is a full bar, and service is excellent. Keep in mind this is a 1952 mobile home. The quarters are small but sufficient. Think of ‘tiny homes’…or a nice efficiency apartment. My wife & I are on the small side. Again, we were quite comfortable. Our top priorities are: Cleanliness - Comfortable Bed - Hot Water - Quietness. The owners hit the bullseye on all four. The wifi is weak, but it was enough to check email for urgent messages and local information. There is cell reception enough for text to come through….but just enough. This was NOT unexpected. Baker, NV is an ‘out of the way location’. We were there for the Great Basin NP…not to stay glued to our devices. There is television reception but only a few channels, nothing really for news and such. That did not bother us at all. Would we stay at this property again? You bet we would! Thank you so much for a great review, we hope you come back someday. All the necessities in great location. This vintage mobile served the needs of me and my friend. perfectly. The owners were friendly and helpful if we needed anything. Enjoyed the deer eating in the orchard at sunset. Location is perfect for anyone wanting to visit Great Basin National Parks - literally 5 minutes from the visitor center. Thank you for staying with us and welcome you back any time.